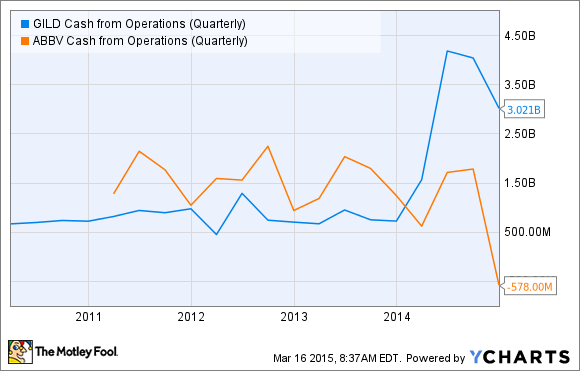 Better Dividend Stock: AbbVie or Gilead Sciences, Inc.? AbbVie and Gilead are two closely followed dividend stocks in the healthcare sector. Which one offers investors the better long-term prospects moving forward? Dividend stocks are without question a powerful asset for investors with a long-term outlook. Even so, the dynamic interplay among cash flow, M&A activity, and product development can make it difficult to select the right income-generating stocks for your portfolio. These issues are particularly troublesome in the rapidly evolving healthcare sector, where cash flows are frequently plowed into expensive acquisitions and/or the development of new drugs. AbbVie (NYSE:ABBV) and Gilead Sciences (NASDAQ:GILD) are two dividend-paying healthcare companies that perhaps underscore these issues best. Namely, we've seen both companies invest heavily in their clinical pipelines and M&A activity of late, but still find a way to reward shareholders via a quarterly dividend. Although both companies have generated market-crushing returns for investors over the last few years (shown by the chart below), they are fundamentally different types of dividend stocks. For example, Gilead only recently started paying a dividend, whereas AbbVie has earned the distinction of being earmarked as a "dividend aristocrat" for consistently paying and raising its dividend. The two companies also offer drastically different yields, with AbbVie's current yield of 3.5% more than doubling Gilead's at 1.7%. As history and current dividend yields don't say much about each company's prospects going forward -- or even their ability to support a payout, let's consider which stock offers the better opportunity right now. After announcing a $21 billion buyout of Pharmacyclics earlier this month for the blood cancer drug Imbruvica, AbbVie has begun its hunt for post-Humira patent expiration revenue growth in earnest. The problem, though, is that this acquisition will probably cause earnings to absolutely crater in the short-term, once the deal closes sometime in the second-quarter. Depending on how management decides to structure this massive expenditure, we could see AbbVie post net losses for multiple consecutive quarters starting in the third-quarter of this year. In fact, this deal isn't expected to add to earnings until 2017. Put simply, AbbVie's shares are likely going to be under significant downward pressure soon. Turning our attention to the dividend, AbbVie hasn't mentioned anything in the way of a reduction, and even recently increased the quarterly payout by 17% to $0.51 a share. Unfortunately, this yield might ultimately turn out to be unsustainable. The company's management has already suggested that another smaller acquisition could be in the works, potentially putting more pressure on its credit rating. So to maintain its current positive rating from agencies such as Moody's and still pursue value-adding acquisitions, AbbVie may have to avoid any further debt by paying cash in any future deals, meaning that its cash flows could take yet another hit. Although we haven't seen a proper accounting of AbbVie's financials since the blockbuster Pharmacyclics deal, it's hard to see how the drugmaker can continue paying a comparatively high yield, execute a multibillion dollar share repurchase program, and remain aggressive on the M&A front. Something has to give, and it could be, at least partially, the dividend. This meaningful uptick in free cash led the biotech to offer its first dividend payment of $0.43 per share on a quarterly basis starting in the second quarter of this year. In the same breath, management also announced a $15 billion increase to its share repurchase program, showing their confidence in the company's performance moving forward. And they appear to be correct in their assessment. According to some recent script estimates via IMS, Gilead's hep C drugs are on track to generate over $12 billion in U.S. sales in 2015. If that line holds, this record-breaking franchise could rake in more than $15 billion in total sales this year, leading to another blowout year in terms of beating consensus -- as well as annual guidance for that matter. 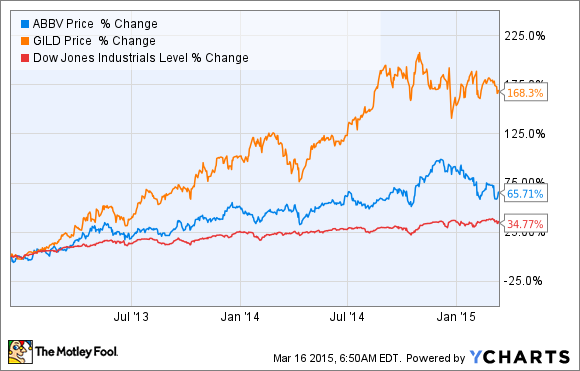 So which dividend stock is the better long-term buy? AbbVie has a way of surprising the Street and this time may turn out to be no different. That being said, Gilead simply has more impressive cash flows right now and doesn't appear to be on the cusp of executing any major deals. As a result, Gilead looks like a much better option for investors seeking a stable yield and strong growth prospects for the long-haul.